I’ve been making slow but steady progress on my tool chest. I glued up my panel and frame lid, and it turned out quite nicely. “If it’s worth doing, it’s worth doing well.” Panel and Frame lid all glued up. 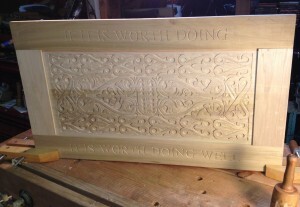 Detail shot of the carving for the sliding tool trays. The top two trays will be shorter, with the bottom tray much deeper. I am trying out some of long thin patterns that normally go on the thin stiles of chests in 17th century style carving. The S Scroll should come as no surprise, it’s common as dirt on most carved items from the period. This is primarily due to (in my humble and increasingly practiced opinion) it’s incredibly flexible nature. You can fit it in long thin areas, wider long areas, or as more elaborate center panel design. It stretches, and scales nicely into lots of spaces, unlike strapwork or guilloche type carving which requires a more careful layout approach. 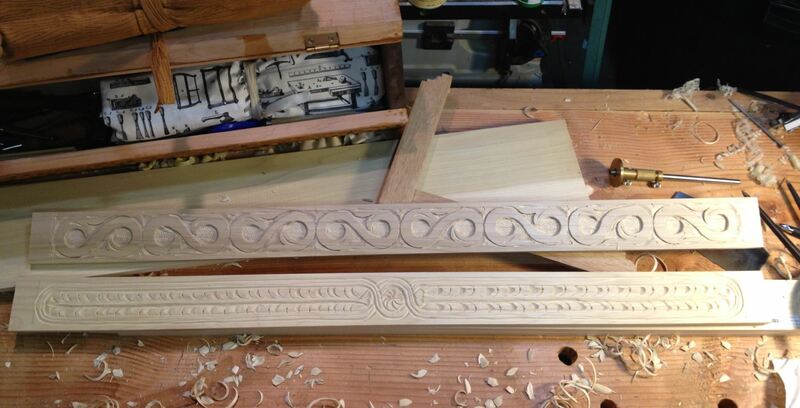 It’s also a relatively simple pattern to carve, especially when your tool kit is more limited. I’ve even seen chests that use primarily if not exclusively the V tool to carve all the scrolls. The second pattern is a new one for me, that I quite like how it worked out. It’s based on the vertical stile (I hope that’s the right term, I get my muntins and stiles mixed up) on a Thomas Dennis or William Searle chest at the Met. It looks floral which was common, but I keep thinking of it as a feather. Full view of the two tray sides. Hoping to get some quality time in the shop this weekend, but I might end up playing with Legos with my son. Tough job sometimes, but it’s got to be done. 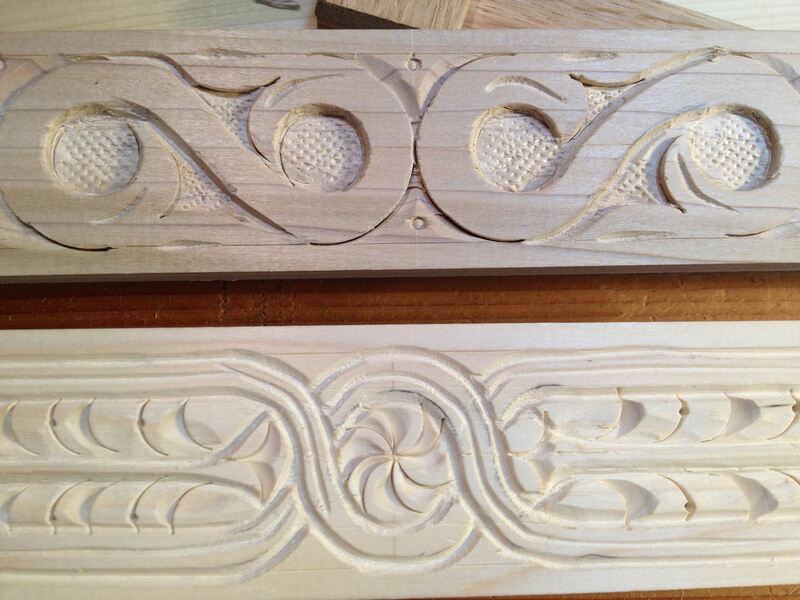 The wood you’re carving on … is it flat sawn, quarter sawn or riven? 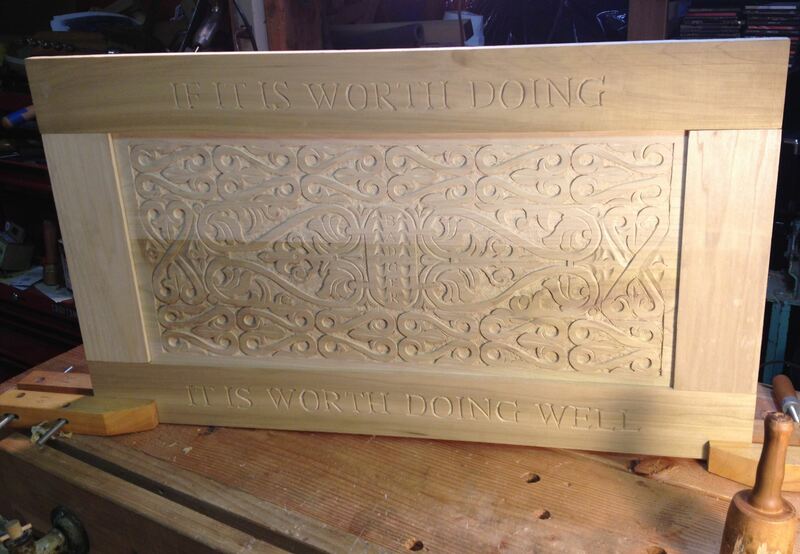 Can you tell me about your experiences carving on those variations? 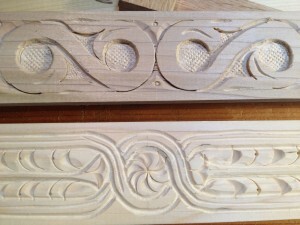 Is the typical flat sawn material more difficult to carve? This is some flat sawn poplar, pretty much the lowest I would consider carving. The only thing going for it is that is straight grained. I’m learning how to carve this because it’s cheap, and light enough but still considered a “hardwood”. The rest of my chest is made of it, so I kept with it. As for how it carves, I’ve learned to keep my designs “big and bold” because small details will chip out quickly. I had to use glue on another piece to pin down pieces that kept popping off. It’s not as bad a I had feared though, but it certainly requires a steady hand and sharp tools to work with cleanly.